Last evening the “Inspired By” exhibition launched at the Summerland Arts Centre, a first for this initiative of the Summerland Community Arts Council in conjunction with the Ryga Arts Festival. The rooms of the Centre were abuzz as creatives and their friends celebrated each other and the creation of 70 new works. “Inspired By” matched writers and visual artists who each received a piece of visual art or writing. Each then created a new piece of work inspired by what they were given. The outcomes were quite extraordinary, and reading the artists statements it was very clear that even over a long distance, and engaging with someone we have never met, we can influence one another’s creative process in surprising and beautiful ways. Lesley-Anne Evans was invited to submit two poems, An Artists’ Invocation and Love Song for Morning. In return, she received the visual works Windfall, by Kathy Smith, and Blue Cottage, by Mary Fisher. Lesley-Anne looks forward to meeting the artists who inspired her new poems The Lifespan of Peaches and Original Wisdom, as she was unable to locate them last night in the busy and joyful gathering. She did have the pleasure of meeting the artists who received her poems. Congratulations to the event organizers, promoters, and especially all the talented creatives who inspired one another to create more beautiful things. The “Inspired By” exhibition continues until September 27, 2018. Visual art pieces are for sale. Poems and stories are free to view. Copies of Lesley-Anne’s poetry is available upon request through this website or by emailing evanslesleyanne@gmail.com. In April, 2016, Kelowna Museums Society approached Metro Community and invited them into a collaboration. Lesley-Anne Evans, Metro Creative Curator, and Linda Digby, KMS Executive Director, began to envision how to creatively offer opportunities for story telling in the voices of the Kelowna street community. Amber Krogel (Metro) joined the collaboration late spring 2017, and brought an exciting new element to bear, that is, the distribution of disposable cameras to project participants. Together with written narratives, these day-in-the-life photographs answer a deeper question, that is, what is important and beautiful to those with real lived experience of homelessness in Kelowna. Amanda Snyder (Curatorial Manager, KMS) Lesley-Anne, and Amber melded artistic, educational, and relational approaches for the purpose of impacting the public perception of homelessness. Supported by key relationships within the Metro team and other social agencies, each project participant was gently encouraged to complete the task of offering their beauty and truth to the world. SEE:kelowna opened at the Okanagan Heritage Museum on August 29, 2017, and is part of the KMS permanent collection. The creative installation includes an interpretive cart and contents, artistic creations, statistics and facts, a favourite photo of each participant offered as a postcard, visitor feedback in response to thought provoking questions, and an accompanying website. The installation continues to morph and change as community members become engaged with the work. SEE:kelowna participants Rob and Diane offered music, poetry, and personal insights at the opening, a moving experience for those attending. RED COUCH is a pop-up visual arts gallery celebrating the art of Metro Community artists and friends. Red Couch doesn’t take a commission, instead they support, honour and share Metro Community artists works in hopes they will find a way into the lives and hearts of others. Lesley-Anne led the ideation and creation of Red Couch, and is excited to be opening the bright little street front space to the public. For me, Metro Community is a convergence point of spirit and art, made up of people who are hungry to belong, to be heard, and loved, and at the same time are risk takers open to creative expression and the rawness of sharing that process with others. I’ve seen transformation take place, for example, within our writing circles, where the hard truths of personal experience are spoken of and held with such grace and tenderness. The marginalized and vulnerable are capable of deep love and trust, which is a beautiful mystery. So I believe Red Couch is going to be a surprising place where image dei and the creative spirit of Metro Community is celebrated, and I expect those who come to see the art might just sense something otherworldly is taking place here. If you pass by Red Couch on St. Paul Street in Kelowna, you will see a number of brilliant, vibrant portraits newly installed in the space. They were created by the talented artist Liz Ranney, and will be on display through August 15th. Liz designed the Red Couch logo, and along with her husband, artist Dylan Ranney, consulted with Lesley-Anne during gallery planning and implementation. Liz and Dylan are Metro Community family. You might like to know why a red couch? The retro, up-cycled couch in the Red Couch was found in the corner of a thrift shop. Like the overlooked, burnt out, vulnerable, and disenfranchised people often welcomed into Metro Community, the red couch is slightly tattered, and is an imperfectly beautiful centrepiece. The red couch has become a symbol of home and radical welcome, the heart of Metro Community and the art gallery. “Paint The Town Red” is a mini-launch for the gallery which will take place at Red Couch on Thursday, July 6, 2017 from 5-7 pm. Wear something red for a photo op with the red couch. Red Couch is at 1262 St Paul Street, Kelowna. Kelowna’s Gospel Mission courtyard officially opened for use on September 14, 2016. It was a glorious day for a grand opening, celebrating creative community and this safe gathering space which will graciously welcome our city’s most vulnerable for years to come. A special congratulations to poets Norm and Nobu, whose meaningful and honest words now grace the walls in brightly coloured steel panels. Lesley-Anne Evans was invited to commission and mentor the poets throughout the creative process from ideation to installation. Leon Avenue has often been cluttered with the personal belongings of those served by the Gospel Mission – causing complaints about the eyesore. Randy Benson, Executive Director with the Gospel Mission, says there was no place for clients to wait for services outside except the sidewalk, but that has now changed. Chris is one of the Gospel Mission’s clients who has been using the courtyard space. He says staff allow him to woodwork in the space, a favourite pastime of his. “I am very lucky to be here. I like the environment and it keeps my mind off of things. It is a safe place and drug-free zone. I really enjoy it,” said Chris. The KGM courtyard project was coordinated by the British Columbia Society of Landscape Architects – Interior Chapter, with wide community involvement. Well done dreamers and creatives and politicians and donors and accounts people and hard labourers and craftsmen. Well done team, well done!!! Darling, do you write prose? Can you write a libretto for a commissioned opera? Alexandra Babbel, Artistic Director, Opera Kelowna. And so the conversation began, in early winter, 2014. Opera Kelowna commissioned Lesley-Anne Evans to write a libretto, and enter into a creative collaboration in which a visual art installation by Jane Everett, and filmography by Daniel Cameron, would come alive in a new Canadian operatic production, to a musical masterpiece created by one of Canada’s most renowned composers, Imant Raminsh. Before an opera is performed, a narrative or story is written, perhaps based upon a theme, and for an assigned performance length. Before any musical notes dance in a composers mind, characters and symbols and themes come to life in a librettists imagination. Time, research, input, editing, testing, editing, and a story begins to morph and solidify. Characters are named. Personalities are developed. Relationships grow. A story line is committed to, and written down as truth, in a format called a libretto. The libretto is the script of the operatic work. Then, a magical melding of words and music takes place, as the composer takes the libretto and sets all dramatic conversations and clever pronouncements and interactions between each character to a new musical score. The composer creates each character’s identifying melody, makes audible the sound of hopes and dreams and conflicts, writes the connecting musical themes between acts, and the openings and closings of the overall work. The composer makes the words…SING! Yes, and he has the power to make the librettist and the future audience weep with the beauty of his music. And then, finally, after much application of time and gift and patience and input, a new operatic composition is born, with words and music blended seamlessly into a score. Meanwhile, brilliant artwork is created, filmography is envisioned and shot, funds are raised, singers and orchestra members are hired, costumes are dreamed alive, custom jewelry ‘vial-of-tears’ is handmade, and the collaboration of a large team of creative individuals continues to synergize, mold and develop to bring the work to the stage in a huge outlay of time and energy and excitement. Opening night is anticipated by all, and it is almost here!!! Alexandra Babbel’s idea, has become a reality!!! Following is the narrative of LAKE OF TEARS, a new Canadian Opera, to the libretto of Lesley-Anne Evans. And very soon, the gorgeously haunting music of Imant Raminsh’s score will be heard as LAKE OF TEARS is performed for the very first time, in Kelowna, British Columbia. Jane Everett’s installation of luminous canvases and iconic art pieces, along with Daniel Cameron’s filmography, will create an sensuous stage for the audience’s experience of an Okanagan fantasy. You won’t want to miss it! Tickets and details through Opera Kelowna, and at Rotary Centre for the Arts. Once upon a time, in a faraway land, the Loon people transformed at will at the water’s edge, and enjoyed living on land in human form, or on the water as loons. Brothers Turmoil and Gavia, both in line for the Throne of Loons, and for the rule of the Loon people, are secretly in love with the beautiful Viviana whom they hope to marry, and with her produce a royal heir. The brothers pursue Viviana to win her love, and Viviana gives her heart to Gavia. Rejected by Viviana, and now filled with hatred for his brother Gavia, Turmoil seeks power through dark magic. Turmoil curses Viviana and Gavia to live separate lives forever; Viviana, to remain on arid land in human form with all the Loon people; Gavia, to live alone on the great lake as a loon. Heart broken, Viviana secretly collects her tears of love in a magical vial she wears around her neck. According to ancient legend, a royal heir has power to lift the curse, but only in their 16th year on the anniversary of their birth. Before sunset on that day, the heir must pour true love’s tears into the headwaters of the sacred pool to set the Loon people free. With Viviana and Gavia now cursed to live separate lives, Turmoil vows to destroy the sacred pool, preventing the Loon people from ever transforming at the water’s edge, and any possibility of the lovers being reunited. Turmoil is unaware of the existence of an heir. Masika, the secret love child of Gavia and Viviana, and their royal heir, carries power to end the curse and strip Turmoil of his dark magic. Sixteen years have passed, and Masika is now coming of age to fulfill the ancient prophecy and free her people. Join Masika as she goes on an extraordinary journey and discovers the power of true love. 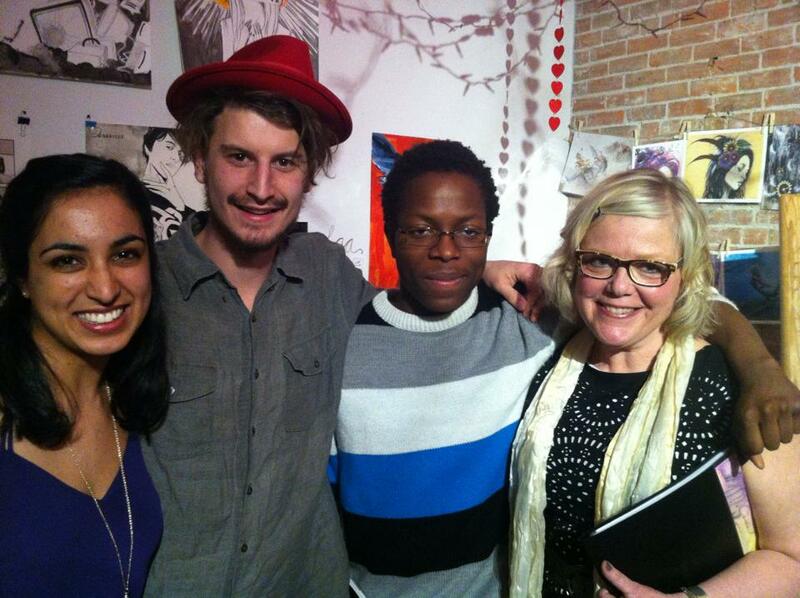 Poets, from left to right; Emmy Chahal, Nygel Metcalfe, Lolu Oyedele, and Lesley-Anne Evans. Wednesday evening, four local Kelowna poets served up a live poetry show called “Make Love Poems” at heART School on Pandosy. Each poetic collaborator, collaborated collaboratively in a love poem collaborative. They wrote #hastag poems on social media leading up to their event, then pinned up #allwedoismakelovepoems Pop-Up-Poetry around Kelowna as an invitation and a gift to whomever found them. Their event included individual work and, your guessed it, collaborative works. The audience was invited to collaborate in an interactive poem, posted HERE. It was an extraordinarily creative and heart warming meeting of intellects, minds and souls. True collaboration. And, if you are interested in adding your name to the growing list of those interested in an #allwedoismakelovepoems book, please do so by commenting on our event Facebook Page HERE. In heART School’s 2nd annual celebration of February as “Paper Month,” Lesley-Anne Evans joins with a collective of talented local artists showing their works on paper, for sale, at heART School, 1546 Pandosy St. in downtown Kelowna, B.C. 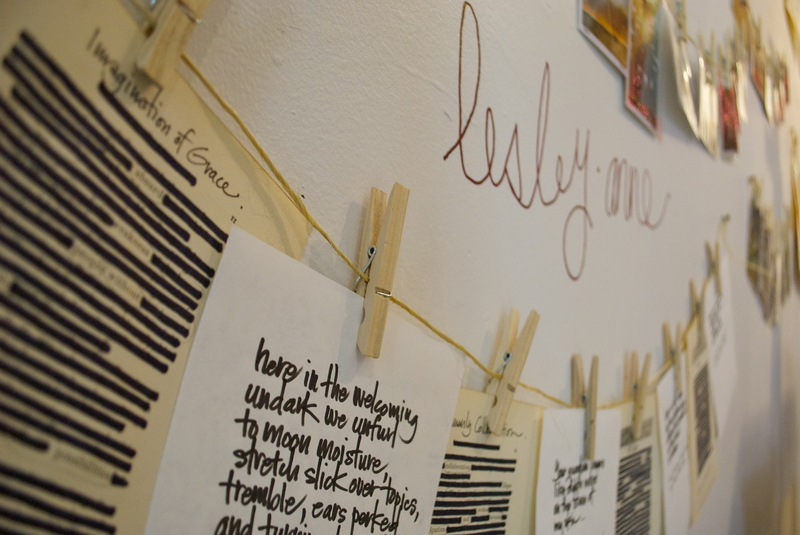 Lesley-Anne is offering her poetry, handwritten onto nostalgic postcards and quality papers, in blackout poems on vintage pages, and on romantic photo-ready framing mats. Poetry scrolls and tea lights are available from Lesley-Anne’s Illumination collection, and other new works melding poetry and paper. See the slide show below for more information. Lesley-Anne joins Carrie Harper, Joleen Mackie, Nikki Balfour and other local artists with a wide array of original works celebrating the month of love and loss. Your Valentine will thank you for any piece of this lovingly crafted romantic art. You may never go Hallmark again! You can share your own words about love in the “All We Make Is Love Poems” drop box! Lesley-Anne will collect your words and craft an “Interactive Poem” which she’ll read at the upcoming Make Love Poems ~ Live Poetry Show, February 25, at heART School. More information on Facebook. Tickets are available through Eventbrite or at the door. Artists and paper go together. Nostalgia and process is what this month is about. Surprise your sweetie with a handmade original work of art.